These include some 'must see' species like the Narina Trojan, Grey and Brown-headed Parrots, Chestnut-helmet Fronted Shrike, and Purple-crested Turacos to name a few. A wide variety of waterbirds from herons, storks to waders, African Skimmers and nesting Southern Carmine Bee-eaters and of course not forgetting the majestic eagles, vultures, falcons, storks and Hornbills - something for every bird lover. We invite you to visit Chilo Gorge Safari Lodge to experience our 3-night Birding Safari, visiting the various rivers and water pans, nearby Chivilia Falls, Mahenye Island and our Sacred Sand Forest - all under the guidance of our experienced professional guides. 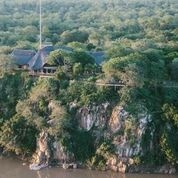 3 nights Chilo Gorge Luxury Lodge, all meals, teas and coffee and set Birding activities with our Chilo Guides. Terms and Conditions Apply and please note that we cannot guarantee all bird sightings.